Looking for the perfect dish to take pride of place on your Christmas table this year? 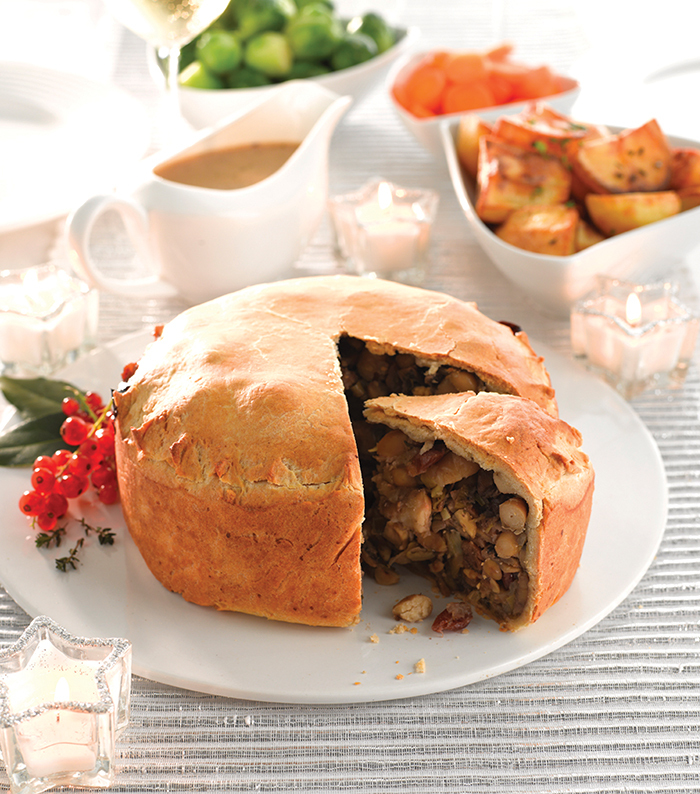 Well look no further than this sumptuous vegan Christmas pie that’s stuffed with beans, cranberries, nuts and veggies! Gently fry the onions and leeks in the oil for 5 minutes. Add the garlic, 150g (5½oz) mushrooms, the cranberries, butter beans, chestnuts, hazelnuts, thyme and mustard. Continue to cook for 10 minutes – the mixture should be fairly dry. Season with salt and pepper, then add the remaining mushrooms and remove from the heat. Heat the water in a saucepan. When boiled, add the suet and stir vigorously. Remove from the heat. Carefully gather the mixture into a ball, turn onto a work surface and knead the pastry for 5 minutes. Lightly grease a 20cm (8in) loose-bottomed deep pie dish. Take three-quarters of the pastry and roll it out. You should not need to dust your work surface with flour. Carefully line your pie dish. Roll out the remaining pastry to make a lid. Place it on the top of your pie, trim the excess pastry, then pinch the two layers of pastry together to seal in the filling. Brush the top with a little soya milk and place in the oven for 1 hour, or until the pastry is golden brown. Carefully release the catch on the pie dish and lift onto a serving dish.